We resume our serialization of this classic on the Immaculate Heart now that I have access again to the book. The Holy Ghost is wont to describe many things with few words. Wishing to praise the principal faculties of the body and soul of His Spouse, the Blessed Virgin Mary, and to exalt the merits of her Heart, He uses very few words, which nevertheless contain many meanings. What does He say? How does He praise Mary, the sovereign of hearts? He utters only three words: Quod intrinsecus latet (Song 4:1,3 what is hid within). But these three words encompass all the great and admirable utterances that can be said or thought of her royal Heart; they reveal to us that it is a treasure hidden from the most enlightened eyes of heaven and earth, a treasure so filled with celestial riches that God alone can have a perfect knowledge of its wonders. Notice that the Holy Ghost pronounces these words not only once, but twice in the same chapter. He does this in order to impress them more strongly on our minds and to oblige us to consider them with greater attention, as well as to manifest to us both the corporeal heart of the Queen of Heaven...and her spiritual heart, of which I shall speak now. What is the spiritual heart? In order to understand it, we must remember that, although the soul is essentially one, it can nevertheless be considered as having a threefold life. The first and lowest life is that of the vegetative soul, which is similar in nature to that of plants, for the soul in this state has no other function than to nourish and sustain the body. The second is the sensitive life, which we have in common with animals. The third is the intellectual life, like that of angels, comprising the intellectual memory, the intellect proper and the will, together with the highest part of the mind, which theologians call the point, the summit or the eminence of the spirit. This last power is led not by the light of complex reasoning, but by a clear intuition of the intellect and a simple movement of the will whereby the soul submits to the truth and the will of God. It is this third life called spirit, the mental, superior part of the soul, which renders us like the angels and carries with it in its natural state the image of God and in the state of grace, a participation of the divine nature. This intellectual part is the heart and the noblest portion of the soul, for, first, it is the principle of the natural life of the rational soul, which consists in the knowledge it can obtain of supreme truth with the aid of the natural light of its intelligence, and in its natural love for sovereign goodness. Animated by the spirit of faith and grace, it becomes the principle of the supernatural life of the soul, which knows God by celestial light and loves Him with supernatural love. "This is eternal life: That they may know thee, the only true God" (Jn 17:3). Secondly, this intellectual part is the heart of the soul, because in it is centered the will, the faculty and capacity of loving, but in a manner much more spiritual and noble and exalted and with a love incomparably more excellent, more lively, more active, more solid and durable than the love which proceeds from the sensitive and corporeal heart. The will, enlightened by the light of the intellect and the torch of faith, is the principle of this love. When it is led only by the light of human reason and acts only in virtue of its natural capacities, the will produces only a human and natural love incapable of uniting the soul to God. But when it follows the torch of faith, and is moved by the impulses of the spirit of grace, it becomes the source of a supernatural and divine love, which makes the soul worthy of God. Thirdly, sacred theology teaches us that, even though grace, faith, hope and charity spread their heavenly influence and divine movements to the other faculties of the inferior part of the soul, they nevertheless reside and have their true natural dwelling in the superior part. Hence it follows that this same part is the real heart of the Christian soul, because divine charity can have no other abode than the heart which possesses it, according to the words of St. Paul: "The charity of God is poured forth in our hearts" (Rom. 5:5). Fourthly, St. Paul proclaims to all Christians: "Because you are sons, God hath sent the Spirit of his Son into your hearts," (Gal. 4:6) and assured them that he bends his knees to the Father of Our Lord Jesus Christ to obtain the privilege that His Divine Son may dwell in their hearts (Eph. 3:14-17). Now, what is this heart, if not the superior part of our soul, since the God of grace and love cannot dwell in a Christian soul elsewhere than in the part where grace and charity reside? All this clearly demonstrates that the true and proper heart of the rational soul is the intellectual part, called spirit, the mental, superior part. This being so, the spiritual heart of the Blessed Virgin Mary is the intellectual element of her soul, comprising her memory, intelligence, will and the supreme point of her spirit. This is the heart which expresses itself in the first words of her admirable Canticle, the Magnificat: "My soul doth magnify the Lord: and my spirit hath rejoiced in God my Savior" (Lk. 1:46-47). It is the spirit, the soul's first and noblest part, which must, in a very special manner, glorify God and rejoice in Him. Of this marvelous heart I have great things to say. But to use the language of St. Paul, even all human and angelic tongues together pronouncing everything that could be said would still fall far short of its perfections. "Of whom we have much to say, and hard to be intelligibly uttered" (Heb. 5:11). If the virginal heart beating in the consecrated breast of the Virgin of virgins, the most excellent organ of her holy body, is so admirable, as we have already seen, what must be the marvels of her spiritual heart, the noblest portion of her soul? Is it not true that, as the condition of the soul surpasses that of the body, so also does the spiritual heart excel the corporeal? We have already considered the rare prerogatives of her heart of flesh, and we shall now endeavor to express the incomparable gifts and inestimable treasures with which her spiritual heart is filled. I shall place before you only a short summary to encourage you to bless the source of so many marvels, to praise her who made herself worthy of so many graces, and to honor her most holy heart, which so faithfully preserved her graces and privileges and used them so perfectly. First of all, Divine Bounty miraculously preserved the heart of the Mother of Our Saviour from the stain of sin, which never touched it because God filled it with grace from the moment of its creation, and clothed it with purity so radiant that, next to God's, it is impossible to conceive of greater purity. His Divine Majesty possessed her heart so completely from its first instant that it never ceased for a moment to belong entirely to Him and to love Him more ardently than all the holiest hearts of heaven and earth united. Such is the opinion of many great theologians. In the second place, the Father of Light has filled this beautiful Sun with the most brilliant lights of nature and of grace. If we consider the natural illumination shining within Mary, we see that God gave to the chosen Spouse of the Holy Spirit a natural intellect more clear, lively, profound, vaster and more perfect in every way than any other intellect, an intellect worthy of the Mother of God, worthy of the woman destined to guide and rule Divine Wisdom, worthy of the Mistress of the Church and Queen Regent of the universe, worthy of her who was to converse familiarly on earth with the angels of heaven, and what is more, with the King of Angels, for thirty-four years, an intellect worthy of the lofty functions and sublime contemplation to which she was consecrated. As regards supernatural light, the luminous heart of Mary, Seat of Wisdom, was so filled with its radiance that the learned Albert the Great, nurtured in the school of the Mother of God, plainly teaches, together with many other holy Doctors, that there was nothing Our Lady did not know (Tract. Super Missus est, cap. 149). They assert that she possessed infused knowledge of every science, and in a much more eminent degree than the most learned minds that ever existed. The vast knowledge of the Blessed Virgin Mary was dedicated to a most holy use, employed only to urge her to love God with greater ardor, to procure the salvation of souls with greater fervor, to hate sin more vigorously, to humble herself more profoundly, to despise still further everything that the world esteems and to prize and embrace with greater affection the things it detests, namely poverty, abjections and suffering. Moreover, Our Lady never experienced undue pleasure in the lights that God imparted to her, never became attached to these favors, never preferred herself to other beings on account of them, but always returned them to God as pure as they sprang from their source. Such was the knowledge of the Admirable Heart of Mary. What shall we now say of the twofold love that inflamed her heart, her love for God and incomparable charity for men? It was by the force of love and humility that Mary attracted the well-beloved Son of God, the Heart of the Eternal Father, to be the Heart of her heart. The love of Mary's most blessed heart makes it an inexhaustible source of gifts, favors and blessings for all those who truly love their Mother most amiable, and honor with affection her most lovable heart, according to the words the Holy Ghost puts on her lips: "I love them that love me" (Prov. 8:17). Finally, it is this heart which has loved and glorified God above all the hearts of angels and men, and therefore, can never be revered adequately. What honor is due to such great and admirable wonders! What veneration should be shown to the heart of Mary, the noblest part of the holy soul of the Mother of God! What praises must be rendered to all the faculties of the spiritual heart of the Virgin Mother, namely her memory, her intellect, her will, and the most intimate part of her spirit, which were never exercised except for God and by motivation of the Holy Ghost. What respect her holy memory commands, which only remembered the unutterable favors she had received from the divine munificence, and the graces God constantly showers on every creature, in order to thank Him incessantly! What veneration is due to her intellect, always engaged in considering and meditating on God's mysteries and His divine perfections in order to honor and imitate them! What veneration is also due to her will, perpetually absorbed by the love of God! What honor the supreme part of her spirit commands, which was day and night absorbed in contemplating and glorifying His divine majesty most excellently! 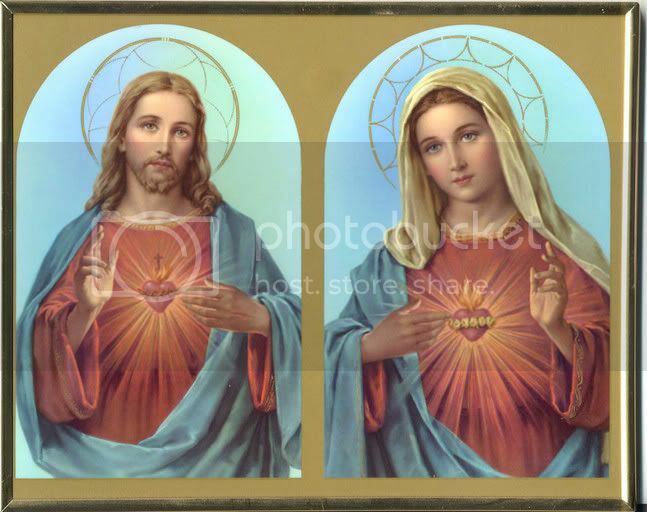 Is there any praise not merited by the marvellous heart of the Mother of the Saviour, a heart which never encompassed anything that could in the least displease Him, a heart so filled with light and grace, a heart possessing the perfection of all virtues, all the gifts, all the fruits of the Holy ghost, with all the evangelical beatitudes? Will you not admit, dear reader, that, if heaven and earth were to exalt the admirable heart of Mary eternally with all possible strength and if the entire universe were to thank God for having filled her heart with such a wealth of marvels, this honor and thanksgiving could never fittingly be made.